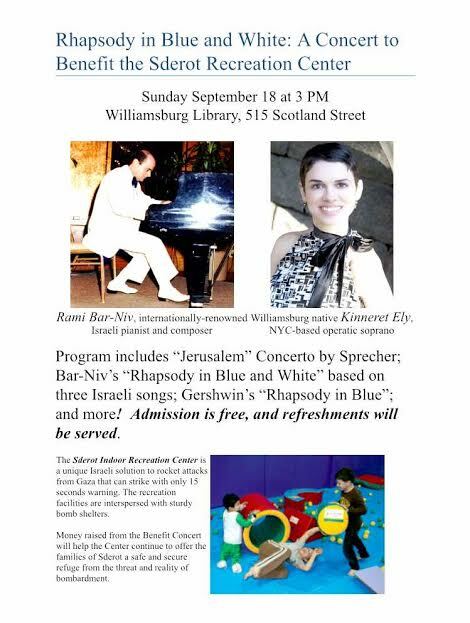 I'm singing in a benefit concert on September 18 at the Williamsburg Library Theatre for the Sderot Recreation Center in Israel, as part of Nancy and Philip Burstein's Bnei Mitzvot project. Among the pieces I'll perform are songs by Rami Bar-Niv from his song cycle Longing for My Father, which are set to poems by Yaakov Barzilai. Barzilai was a Holocaust survivor whose father died in the Holocaust, and the cycle is about his experiences with that loss. Working on these pieces made me realize even more deeply that songs and repertoire focused on certain periods of history (especially works based on first-hand accounts) are important because they provide data with a soul, so to speak. It's one thing to read about historical events, in a merely factual way, through history books. It's an altogether different experience to hear about those events through someone's personal story and poetry; that personal effect is enhanced when it's expressed to the audience through an artistic medium that uses the unamplified, vulnerable human voice. Such storytelling opens the door to learn about, and begin to discuss, difficult topics and periods in history in a way that makes people feel safer talking openly about topics one may not normally address.